How to cite CAPRAL data ? In 2005, an ARC Linkage Project Grant to the University of Western Australia in association with the Australian National University and Geoscience Australia enabled the deployment of seven stations (LP and RP01 + RP02) in northwest Australia, designed to improve local earthquake location and hence understanding of neotectonics. 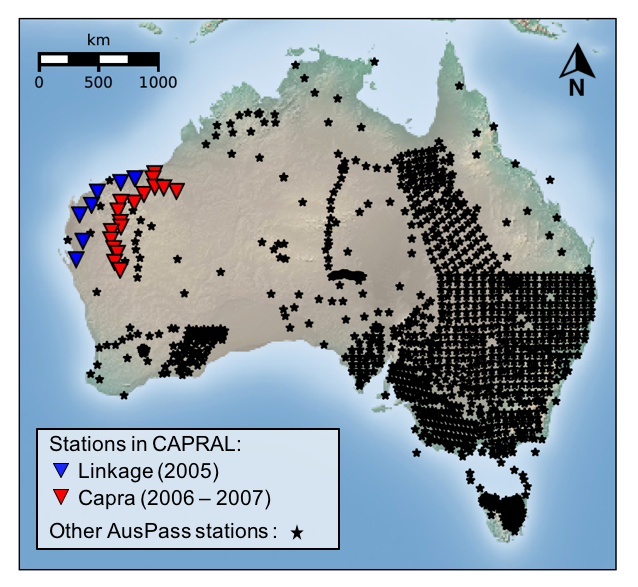 A further set of 18 stations (CP and RP03 to 07) was deployed in Northwest Australia in 2006 and 2007 to link all prior experiments together. CAPRAL (Capra + Linkage) stations provide all together a useful framework to improve the coverage of the Pilbara craton and the Capricorn orogen. Guralp CMG-3ESP seismometers and Earthdata digitisers were used with sampling rates of 25 samples/sec.